What Top 5 Things Are Patients Looking For Online? | ASTRALCOM - Content Strategy, Conversion Marketing and Customer Acquisition. If you’re a healthcare provider that deals directly with patients, then it pays to have your marketing and content initiatives leverage what patients are looking for online. Knowing that most patients start their healthcare information journey online, how do your website and social media content stack up? Does your content plan address what patients and/or payers are looking for? While the report from eMarketer goes into much more depth and is a good read, it’s worth pausing to consider the importance of this basic information. The first five things in that list are prime ways to connect with healthcare consumers – both patients and payers – by creating content that addresses one or more of these very topics. Certainly, by focusing content development on topics that already drive interest, it’s easier to use content as an introduction to a digital relationship. That digital relationship, or customer experience, is the key to creating measurable outcomes (phone call, download, contact request, etc) with content. 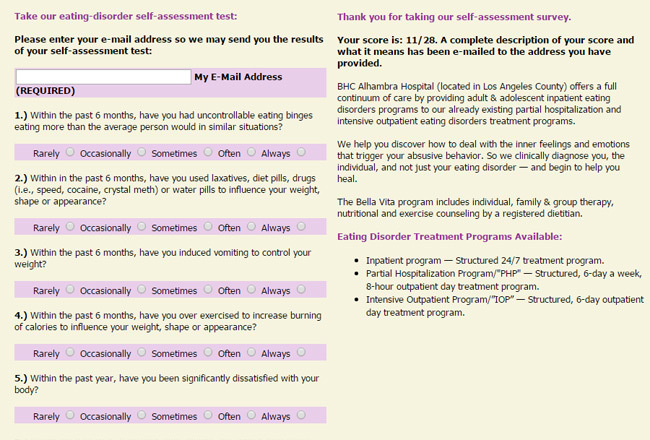 For example, by creating an eating disorders survey for BHC Alhambra Hospital, we were able to help them connect with patients seeking information about and help with their condition. Each survey was scored for symptom severity and the results emailed to the survey respondent. The survey supported a targeted keyword search campaign that allowed BHC Alhambra Hospital to connect with, engage and build relationships with patients who needed their help. Whether it’s creating a survey, providing in-depth information and answers, or connecting directly with patients, it all takes content. Start with something that your medical group or practice specializes in and develop content that demonstrates your expertise. Need help with that? We’ve got you covered – just contact us.